Great tour! Shakalo is passionate about his country and is very knowledgeable in history and politics. We loved the tour and how it was paced. He worked with my love of shopping (the leather shop is amazing!) And even fit in a great sandwich stop at the last minute. My husband and I very much enjoyed our 6 hour tour of Montevideo with Shalako. His English skills are excellent (years of attending a british school in Montevideo) and his local knowledge is quite deep. We particularly enjoyed learning about the government and evolution of the country in recent decades. TOUR GUIDE RESPONSE: Thank you for the 5 star review!! Excellent. Informal and relaxed, yet professional. Shalako is a delightful, calm and very informed young man. His ability to convey the important facts about Montevideo and Iruguay, while entertaining us with anecdotes, is really admirable. I recommend his tours enthusiastically. TOUR GUIDE RESPONSE: Thanks Ted, I enjoyed meeting you too! Shalako and Carlos (Driver) provided a wonderful experience of Montevideo for my Mother and me. Shalako is very knowledgeable and offered a well rounded mix of historical, political , social and economic perspective. We saw all the highlights of the city , enjoyed purchasing special gifts for friends from local artists and had a delightful lunch at a cafe in a local bookstore which was a real treat. It was a fabulous day. Shalako guided me around Montevideo in such a manner that, in addition to providing insight into Uruguayan history, society and culture, I was able to subsequently further explore the city and its people on my own. He's more like a host/ambassador than a typical guide. I highly recommend his services. Shalako is an excellent tour guide. Upon arrival we were warmly welcomed. The tour was extremely good and very flexible (we love this!) and for that he deserves a special thanks. Shalako has such a warm personality and is a joy to hang out with. We truly enjoyed walking the cities and the scenery was beautiful. Shalako is a true sample of excellent tour guide, we recommend him to everyone! TOUR GUIDE RESPONSE: Thank you Preston & Timi! It is for tours like this that I feel privileged to be getting paid just for being myself around wonderful people like you, traveling around the best places of my beautiful country. Hope we get to meet again on my US trip soon! We did a 2 day tour with Shalako where we visited Montevideo and the second day Punta del Este. Shalako provided a large passenger van with a safe, friendly driver. What we liked most is that Shalako arranged airport transportation both to and from the airport with the same driver and van. Shalako was interesting and knowledgeable and passionate about his city and especially soccer! Would definitely recommend Shalako as your Uruguayan tour guide. TOUR GUIDE RESPONSE: Thanks Randy & Sheri for letting me part of your family adventures and for sharing your life stories with me. It was a pleasure. Best wishes! After rescuing our group the previous day when our ship was unable to dock in the planned location, Shalako gave us a terrific tour in Montevideo. We almost felt like locals by the time we left. I would highly recommend him for anyone wanting an enjoyable time in a lovely city. Very descriptive tour guide. Was able to pick us up from the ferry station (coming from Buenos Aires) and introduce me and my son to his beautiful, serene city of Montevideo. From the Old City (Ciudad Vieja) to Pocitos and La Rambla beach district. Also had great dining recommendations. TOUR GUIDE RESPONSE: Thanks Maricarmen & George. Un gusto haberlos recibido. Será hasta la próxima! Shalako was a very knowledgeable and engaging guy who provided an insightful overview of his city. Provided great insights into his country and its history. I had asked Shalako if he could bring a little step stool with him to make it easier for my mother to get into the car (didn't know how high it would be). He had someone fashion one for our use (which we didn't need) so it shows how much care he puts into his guests. We had an awesome drive around the city, bought some nice amethyst (my birthstone) and had a great local meal with his sister. Saw how locals lived too so we have everything we requested done. He is a very knowledgeable, wonderful guide! TOUR GUIDE RESPONSE: Thanks for your kind comment and an enjoyable day together. Hope your new amethyst brings you tons more of that positive energy you already have. Best wishes to you and your mom. Montevideo is not a city with many memorable sights so it was absolutely great to tour with Shalako who shared his views and engaged on a multitude of topics to give us a real understanding as to what is happening inside Uruguay today and what life is like for the average person. Shalako is highly recommended! TOUR GUIDE RESPONSE: Thanks Roger and Lilly for being so easy going. Montevideo's appeal is not only what it is but also what's its not..that is a big metropolis with all the problems that go with it. I'm glad you enjoyed our day together! Wonderful tour fantastic guide, one of the best walking tours taken. Very knowledgeable and obviously loves his guiding. Flexible and sense of humour. A truly fantastic day had by my group. thank you for showing us the best of your city. TOUR GUIDE RESPONSE: Thanks, had a fun time with your group! Thanks much to Shalako! You made our group trip unforgettable! Shalako was an excellent tour guide and his knowledge of history and architecture served to enhance our experience and appreciation of Montevideo, Urguay. He was very proud of his country very much and that was very impressive. We highly recommend him!! TOUR GUIDE RESPONSE: Thanks Jenny I'm glad you and your group felt this way in my hometown Montevideo. Hope there will be another excursion next season. You'll be most welcome! Maybe it is Shalako's degree in social anthropology or, maybe, it's just his charming personality. The three very rainy hours we spent touring Montevideo and discussing history, architecture, culture, and politics was incredible. He is a professional with a passion for sharing his knowledge. You will not find a better guide to Montevideo! We had a fabulous time with Shalako in Montevideo. He conveyed his encyclopaedic knowledge of Uruguay with passion, conviction and humour. We liked how he compared and contrasted Uruguay with its neighbours. We saw so much, it was authentic and unhurried. Awesome - thank you Shalako! Shalako was a fantastic guide. The flight over Montevideo was the perfect start to a great ground tour. He is a knowledgeable young man, with great patience with 4 old people, who were tired and hot. The day got to 38C before it was over, but he kept his cool, and tried to help us keep ours. He showed us just the places we were interested in seeing, and gave us good advise when needed. Lunch was at a great seafood place he knew, and we all enjoyed it. I certainly recommend him very highly to anyone. TOUR GUIDE RESPONSE: Thank you Mary, Ted, Gin & Clancy for this heartfelt comment. I won't be a tour guide forever, but I'll always keep this fun memories of meeting nice kind people like you from across the world. Best wishes and good health to you all! Montevideo was unknown to us and Shalako made it sound and feel like it was one of the best city in the world! He knows the city very well, loves it obviously, and makes us feel privileged to be there. We had a wonderful day with him, learned to know Uruguay (I must say discover) and even if it was Christmas Day, he found an open restaurant so we can share an Uruguayan Barbecue! Thank you Shalako! Montivideo, Uruguay was one of our favorite stops in South America. Shalako was a great guide and very passionate about his city and his country. We could not have hoped for a better experience. We had a last minute change in itinerary, asking Shalako to change the day which he did enthusiastically. He was particularly good in advance communications on meeting place and time and tour outline. He arrived 15 minutes before the agreed upon time. We had a great day, lunch with the locals, great efficient city tour, with shopping per our request. English is very good. He never hesitated using the proper word, and very often used vocabulary that you would only hear a native English speaker using. TOUR GUIDE RESPONSE: Thanks Tina & Jim for your visit and for this thoughtful comment! TOUR GUIDE RESPONSE: Thanks for your visit! Shalako was extremely informative on today's Society and how the present has been influenced by the past. I learned a lot about the people and the country. I particularly enjoyed the great food, wine and conversation. It was a lot of fun! TOUR GUIDE RESPONSE: Thanks Debbie nice spending the day with you too! Our tour was wonderful. Shalako was an awesome, fun guide. He did a great job showing us around Colonia, Punta del Este and Montevideo. We have great memories of our experience with him and how willing he was to find the things that we wanted to do. Thanks Shalako for making our time in your country memorable. Great tour of Montevideo! Shalako's command of English is excellent...and he was very flexible with our group's requests. I recommend Shalako without reservation. TOUR GUIDE RESPONSE: Thanks Ray & Diana & Tom & Linda, best wishes for you guys! I could not have had a more amenable guide than Shalako. His personality and character were just first class, making my tour just fine. TOUR GUIDE RESPONSE: Thank you Mike! glad to see you've made it home safe. Good luck on the tournament. C'mon Carbonero & la Celeste! 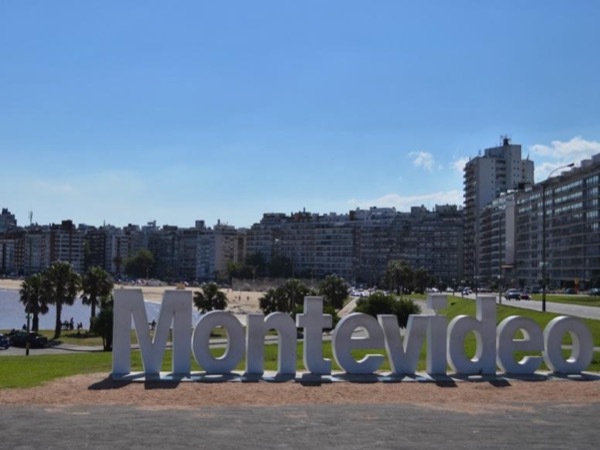 Very thorough history of Montevideo. Met without issue even though ship was late. Excellent tour saw many places and learned a lot. BBQ in market was very good. Very helpful with sightseeing and shopping stops. Would recommend for sure. An extremely well informed and interesting guide. He managed to cover the scenic and more formal visits brilliantly. Greatly enjoyed the day. TOUR GUIDE RESPONSE: Thanks Barry, Stephen, Mary & Tina, it was a pleasure being your host! Shalako truly enhanced our Montevideo experience. He communicated with us prior to the tour and meet us promptly at our hotel. In addition to touring the city, we were hoping to learn about the culture, history and politics of Uruguay. Shalako exceeded our expectations. He was knowledgable, enthusiastic and fun. He was extremely accommodating and customized the tour to our interests. Rather than a tour, we felt like we were being shown around the town by a friend. We certainly recommend his services. TOUR GUIDE RESPONSE: Gracias!! Makes me feel glad you stayed in my country so many days so as to get to know it. The guide did a great job showing us the sites around Montevideo. We were able to see the sites, eat local food, shop in local markets and meet local people. We will never forget out trip and he is one of the reason why it was so wonderful. TOUR GUIDE RESPONSE: Thanks Brad for leaving a comment nice to meet you! Shalako was an outstanding and very knowledgeable tour guide during my visit in Montevideo (MVD). He picked me up in Punta del Este & showed up on time. On our way to MVD we had the opportunity to get to know each other & he mentioned what places we were going to fly over & the places we were going to visit. He was so nice that when I told him I am a coin collector, he took me to the place where I was able to purchase coins. He exceeded my expectations. I strongly recommend Shalako for this tour & others. TOUR GUIDE RESPONSE: Thanks Manuel for visiting my country and for booking this tour which I enjoy the most. Loved the present, all the best for you this new year. This tour was wonderful. Shalako tailored the tour to our interests and requests, while covering the main "highlights" of Montevideo. He was very informed and welcoming. The car used in the tour was clean, the driver was courteous, and best of all, he kept the A/C going for us on a hot day! My daughter and I had a lovely experience, and will treasure memories of Montevideo and our time with Shalako. I would recommend this tour and tour guide to anyone. Mary S.
We met our guide today at the hotel in Montevideo and he was so kind to bring his car for my mother, a young 87 year old women and myself. The weather had been very rainy and it was supposed to be a walking tour, but we ended up walking and driving which was perfect. Our guide was extremely knowledgeable and pleasant. Being a few years older than my son, we were able to talk about issues important to his age group along with general cultural,political and historical issues affecting Uruguay today. TOUR GUIDE RESPONSE: Thank you Cindy let's keep in touch! Shalako was a great guide. He was very accommodating and very personable. We had a most enjoyable day. I don't know what could possibly be added to make the tour any better. Just fantastic. Tour guide helpful & flexible. Took us to great lunch place. Had excellent driver (Roberto). Gave us postcards of Montevideo. Shalako sent excellent instructions on where to meet him and had my name on a paper. His knowledge and sense of humor made the tour very enjoyable. We saw a variety of historical and cultural sites on our walking tour while learning much about Montevideo and Uruguay. We ended our tour in a delightful historical coffee shop for a delicious cappuccino. Shalako not only showed us the sights, but also provided historical background and insights into the current political situation in Uruguay. We came away with a good sense of what it is like to to live there. On the day of the tour both my wife and I were recovering from a bad cold. Shalako adjusted the pace to accommodate our low energy level. We felt more energized at the end of the tour than at the beginning. TOUR GUIDE RESPONSE: Thanks hope you're doing well now! We designed our Tour with Shalkco to include a small winery and tour of Montevideo. We had an excellent time and Shalako was full of all the local happening there! This was our first TBL booking and it was terrific. We travel extensively and our guide Shalako was one of the best guides we've ever had. He's young, articulate, intelligent & knowledgeable, including politics and social issues. He speaks English fluently. His enthusiasm and love for his country made for a fabulous 6 hours. His car was clean, comfortable and air conditioned and our driver Roberto was an expert. Shalako gave us a memorable and complete tour of Montevideo. He gets my top recommendation. TOUR GUIDE RESPONSE: Thanks Jimmy and Ann Marie for this great review! Our tour was excellent in every respect! TOUR GUIDE RESPONSE: Thanks for the comment, spread the word about Uruguay! What a fabulous tour of Montevideo! Shalako was extremely knowledgable about the history, politics, economy, and culture of the city and country. We couldn't have asked for a better day or tour guide. Shalako took us on a great walking tour of "old town" Momtevideo as well as the newer town.He was great in explaining the history and culture of Uruguay. We were able to see and hear about much of the city on a beautiful summer day. he gave us a great recommendation for lunch to enjoy the local cuisine. TOUR GUIDE RESPONSE: Thanks take care! Had a wonderful day out and about in Montevideo. Our guide Shalako was terrific, happy to chat and answer all of our questions. We knew very little about Uruguay, after our tour we had a good knowledge of this lovely country with its very culturally diverse history. Shalako was great with communication prior to the tour and happy to adjust the tour to our needs and wants. Our 12 yr old was thrilled to see some of the street art Montevideo has to offer. TOUR GUIDE RESPONSE: Thanks for this great comment! we covered lots of ground on our walking tour on a very warm day. The street art is one of many less known attractions Montevideo has to offer, glad you enjoyed it! Shalako was an awesome tour guide - he really loves his city of Montevideo and it shows in his excitement and passion for the city, its people and its history. He asked me several questions as we started the day about what I was interested in and what I wanted to see and tailored the tour accordingly. He has a great sense of humor; is a genuinely nice guy and so much fun! TOUR GUIDE RESPONSE: Thank YOU! I really value your comment beacuse you weren't a cruise passenger and came especially to Montevideo on your own and our time together in my city met your expectations. Best wishes to you! We have nothing but high praise for Shalako. His command of English, his knowledge of Punta del Este and Uruguay, his love for his country, and his sense of humor all added to our enjoyment of our tour. We also appreciated his willingness to step in as our guide when the guide that we originally booked unavoidably could not join us. TOUR GUIDE RESPONSE: Thanks Kenneth, Linda, Caroline, David for the nice words. Mariana, your original guide who couln't join you because she's due to having her first daughter, is very happy to know you had a wonderful time with me. Cheers! Shalako was excellent - he met us at the meeting point, was gracious and took us around Montevideo by foot and also by bus. He was thorough and showed us important sites as well as taken us to a local Sunday market where he encouraged us to sample local foods from vendors. His English was flawless! Shalako made our day in Montevideo fabulous! His knowledge and sense of humour made the learning easy and enjoyable. All 6 of us felt after our day with him that we would love to return to Uruguay so that says something! We would highly recommend Shalako show you his city and country! TOUR GUIDE RESPONSE: Thanks Nancy and the whole gang for the comment. I too hope we meet again in Canada someday! Very informative, personal, and interesting tour. TOUR GUIDE RESPONSE: Thanks Thomas! For the booking, the comment, and for visiting my beautiful country! TOUR GUIDE RESPONSE: Thanks Jim! We uruguayans take great pride of our barbecues as you now well know. best wishes to you too! Shalako was excellent right from the beginning, sending us several pictures of exactly where to meet him outside the port. He asked how we wanted to proceed, did we want to walk or always ride, and we ended up doing some of each, leaving decisions to his local knowledge. A social anthropologist, her was able to discuss Uruguay from many facets, which we really appreciate. We recommend him highly to anyone searching for a local native with great humor and knowledge. He was a delight. Shalako made this tour the best I have had anywhere. Starting off with the air tour helped as we drove through and stopped all over the city. He is so knowledgeable about Uruguay but most importantly he is friendly and fun. Shalako took the time to get to know me and my interests. So ToursByLocals will get my business again after this first try. I highly recommend this tour for a wonderful look at the history and culture of Uruguay while having a good time with local Shalako! TOURSBYLOCALS RESPONSE: Thanks of your thoughtful review: we look forward to welcoming you back on your next trip! Five stars. Very knowledgeable and helpful beyond the call of duty. Helped to arrange further activities. Also very personable and pleasant. TOUR GUIDE RESPONSE: Thanks David! I'm aware a local lunch can enhance your experience of my country within your quick cruise stop. Even if the tour was over its the memories that stay, so I'm glad you found my accomodations helpful. Please come back to Uruguay with more time, you're both most welcome! We had a very enjoyable tour with Shalako. He was knowledgeable about Montevideo and took us to a local restaurant for lunch. The tour was also adjusted to our requests and needs during the day. Shalako was an excellent guide,he was informative, enthusiastic, clearly proud of his city and country. Shalako took the time to make sure our tour was focussed as much on our interests as well as the highlights of Montevideo. I would highly recommend him.I was not sure what to expect in Montevideo but after this tour, I would go back to Uruguay for a longer trip. TOUR GUIDE RESPONSE: Thanks Mike! and we managed to return dry besides the end-of-year water buckets festivity around the old city..ha. The fact that you now consider Uruguay as a destination fills me with satisfaction. Fantastic tour. Bruno fell sick, so his buddy Shalako filled in. Very knowledgable and extremely friendly attitude. He was a charming personality and we enjoyed his comments about Uruguay and Montevideo from many perspectives. Shalako was super! He gave us a tour that was perfect. He was so personable, knowledgeable, and fun! We recommend him to anyone traveling in Uruguay. If you can get him as a guide you will not be disappointed! What a great tour of Montevideo we got from Shalako. We took a combination air/driving tour. Totally worth taking the air tour. We were worried on the mtg time due to ship time and Montevideo time, but Shalako had a fellow guide meet us since we were early & confirmed our tour. Great Service! Would highly recommend the air/driving tour and Toursbylocals! TOUR GUIDE RESPONSE: Susan, Thanks a lot for your kind words. It was very nice to go flying and driving with you. Best! Shalako. Shalako is a very nice person. He is very knowledgable and accommodating to our requests We would highly recommend the tour via plane it gave us a great impression of the city and was a great precursor to the tour via car afterwards it was great. Beside it was great fun..